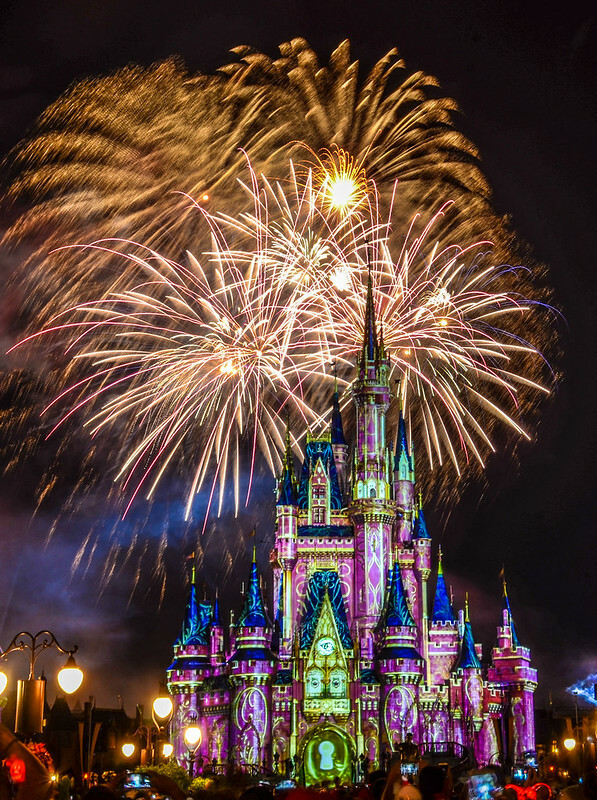 Over the years, we have written many posts about how the Disney Parks have a little extra magic at night. The lights come on, the crowds thin out and the atmosphere changes. Sometimes that is due to extra entertainment or a nighttime spectacular. Other times it’s simply due to a beautiful, secluded area. Whatever the reason, I prefer most Disney Parks once the sun goes down. Full disclosure: I am a night owl and always have been. With all of these ravings about nighttime in the parks you’d think that I would have done a top ten lands to be in at night. That’s what I thought too until I searched this site and didn’t find that post. With my never-ending love for lists on the internet that don’t matter, I had to remedy this precarious situation. Joking aside, hopefully this list is helpful to anyone planning what to do with their evenings in the parks. This list will only include the Disney Parks in America (at least for now) and is mainly looking at overall atmosphere of the land instead of attractions. I will take into account some rides that are especially fun at night but I’ll mostly be relying on sites, sounds and shows. Also known as ‘The 3 S’s’. I’ll also include a few lands that are in both Disneyland and Magic Kingdom and won’t specify as most of the atmosphere is the same. Before we get to the list, here’s a few honorable mention. 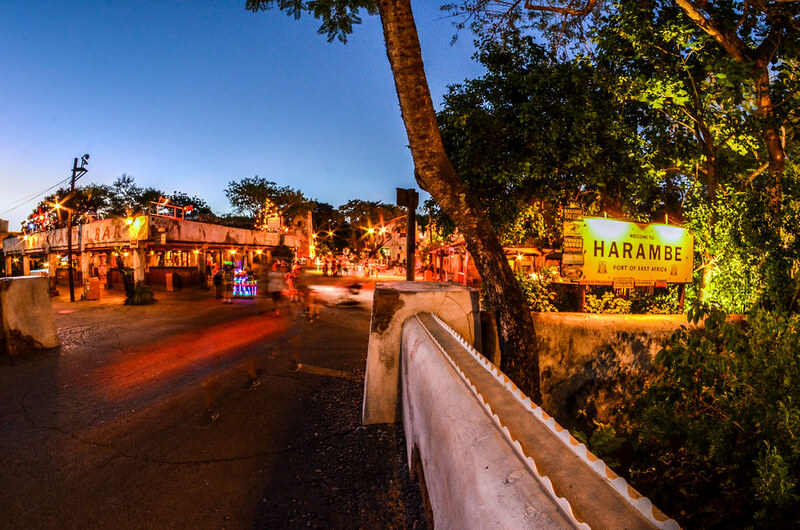 Africa, in Animal Kingdom, has some wonderful entertainment, lighting and an interesting attraction (Kilimanjaro Safaris) at night. There just isn’t much open at night so it doesn’t make the list. Similarly, Hollywood Studio’s Echo Lake is a beautiful and serene spot to sit at night. There’s not much else going on but that’s part of the appeal. It just narrowly misses the top ten. On to the list! 10. Fantasyland – I included both Disneyland and Magic Kingdom versions in this but for separate reasons. Disneyland has great lighting that really augment the colors of the area at night. Plus, riding the teacups at night is the best time to do it. The parade route through this area is also a great place to watch with less crowds. Magic Kingdom has more space than Disneyland and the lighting is somewhat odd because of it. However it makes the list because of the section from Gaston’s Tavern through Storybook Circus (New Fantasyland). Parts of that area are a little dark and if you go late enough then Storybook Circus looks like a ghost town. I don’t think this is exactly what they were going for but it is interesting to me and an odd feeling. 9. 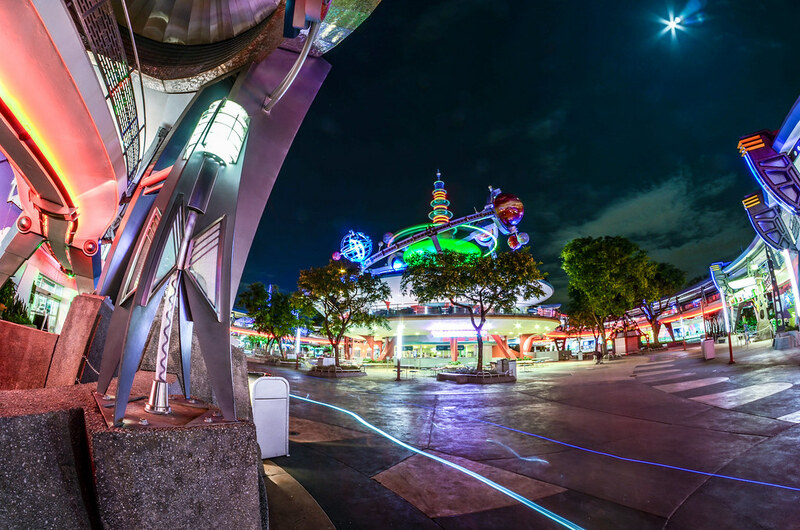 Tomorrowland – I don’t particularly like Tomorrowland but I do think it was made to experience at night. The neon glow bounces off the metallic throughout the land. Magic Kingdom’s PeopleMover is the perfect “I’m tired but don’t want to leave” attraction and a great way to experience the nighttime lighting throughout Tomorrowland and Main Street. Even Space Mountain, an indoor attraction, feels like something that is best experienced at night. 8. 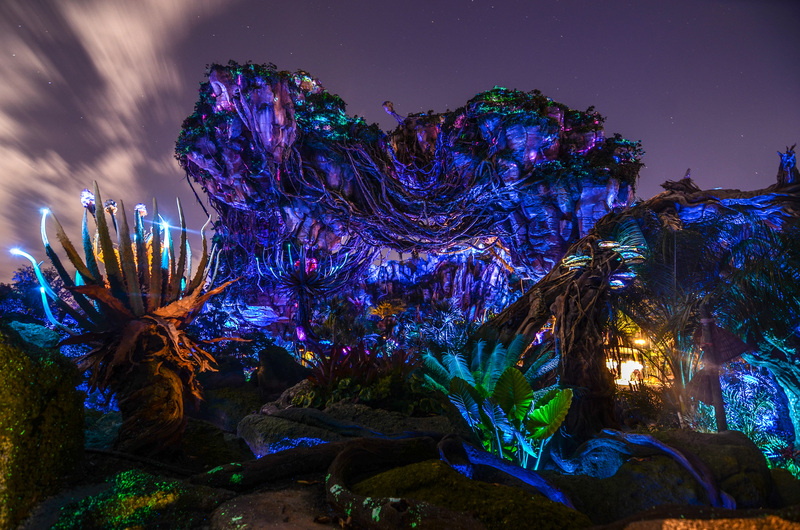 Pandora – World of Avatar – To be perfectly honest, I was slightly underwhelmed with Pandora at night at first. I don’t think that the lighting in the area was completely sorted out at first. It was not quite bright enough for the plants and mountains to really stand out like they do during the day. Still, the bioluminescent areas are ambitious and beautiful. On our latest visit I came to enjoy Pandora more at night. While the experience is different from the day, I do think it’s beautiful. 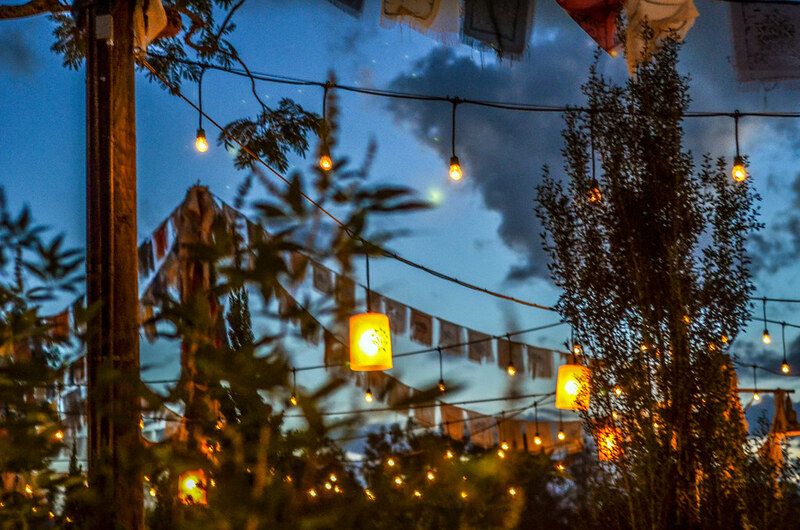 Having less crowds in the area makes Pandora seem far more peaceful, combining that with cool lighting makes for a serene experience. 7. Frontierland (Magic Kingdom) – Magic Kingdom’s Frontierland is spectacular any time of day, featuring Splash Mountain, Big Thunder Mountain, Rivers of America and Country Bear Jamboree. Three of those four are even more fun and beautiful at night. The Country Bears are the same throughout the day but don’t let that distract from their greatness. I especially prefer the river area at night. If you can get to this area right before closing then the area is beautifully photogenic and peaceful, starting with Big Thunder and working your way towards Main Street. 6. 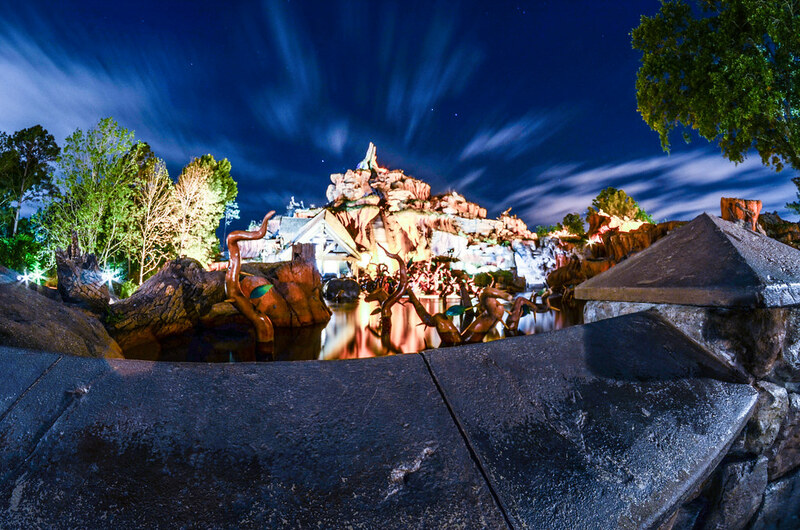 Asia (Animal Kingdom) – A thrilling coaster that’s best experienced at night? Check. Beautiful nighttime lighting that feels organic to the theme and back story? Check. A nighttime show that celebrates the idea of the park? Check. Wonderful and quiet areas to roam around? Check. Asia has it all, and maybe should be even higher on this list. 5. Main Street U.S.A. – People say that ‘there is just something about Main Street’ and I always think that’s kind of dumb. The entrance to the park does have a special aura because of the way it’s designed. The reveal of the castle, framed by the Main Street shops is spectacular. Along with that, the area envelops you in a simpler time. At night that aura is intoxicating with brilliant fireworks shows and a golden glow. Maybe my favorite aspect of Main Street at night is in Magic Kingdom. After closing, as a subtle show called ‘A Kiss Goodnight’ plays intermittently until all guests have left the area. It’s a perfect way to top off a day in Magic Kingdom. 4. Discovery Island (Animal Kingdom) – Animal Kingdom boasts some of the best nighttime entertainment of any park and it is prevalent in Discovery Island. The area has a party atmosphere that Disney often tries to capture but hardly ever succeeds at. Instead of a DJ playing popular songs on a stage, live music is abound and dancers are all around. I just pull up a seat, with a mandarin lemonade from Flame Tree Barbecue, and watch people enjoy themselves. 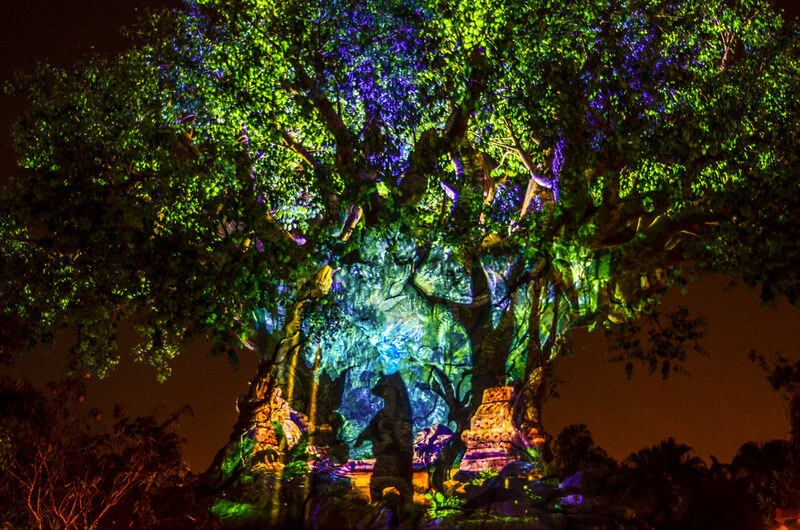 If that’s not your thing then head over to the Tree of Life and enjoy the Tree of Life Awakenings, which is one of the more beautiful additions Disney has made to their parks in many years. The whole area at night fits Animal Kingdom exceptionally well. 3. 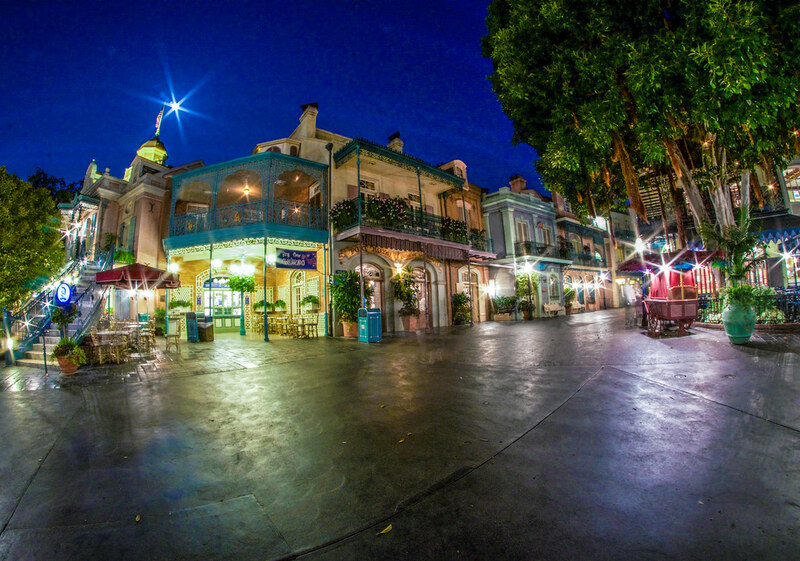 New Orleans Square (Disneyland) – Live jazz music, beautifully lit backstreets, a foreboding mansion and a glorious show along the river make New Orleans Square one of the best nighttime lands. This land’s colors show exceptionally well at night. 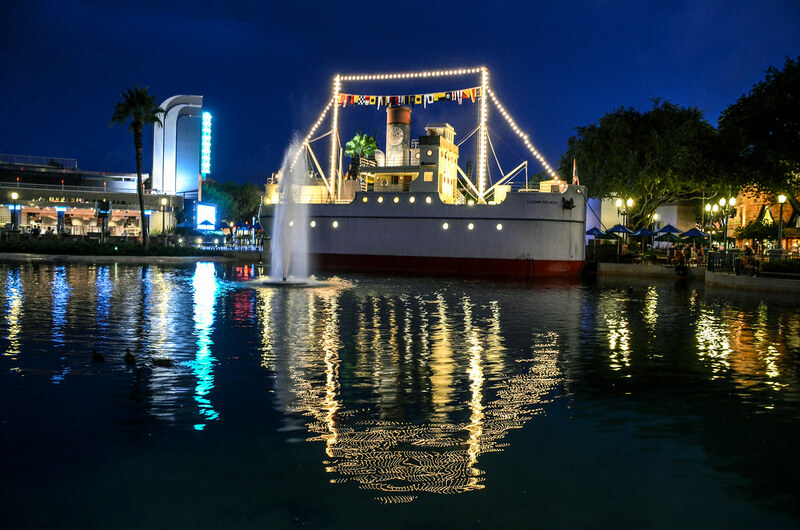 Riding the land’s two attractions, getting a bite to eat while listening to live music, watching Fantasmic! and then sticking around the area for some side street wandering is a perfect way to spend an evening in Disneyland. If nothing else, go enjoy Fantasmic! It’s the quintessential Disneyland experience at night. 2. 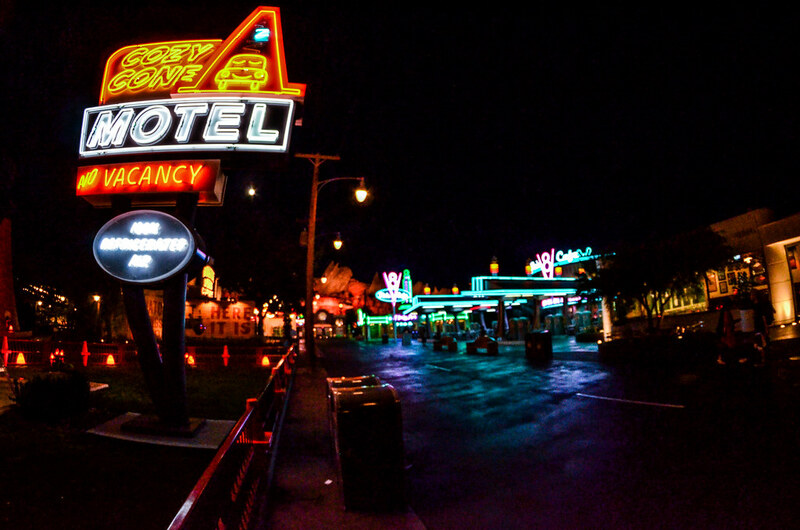 Cars Land (California Adventure) – Cars Land is exceptional anytime but is best at night. The neon is warm and inviting. 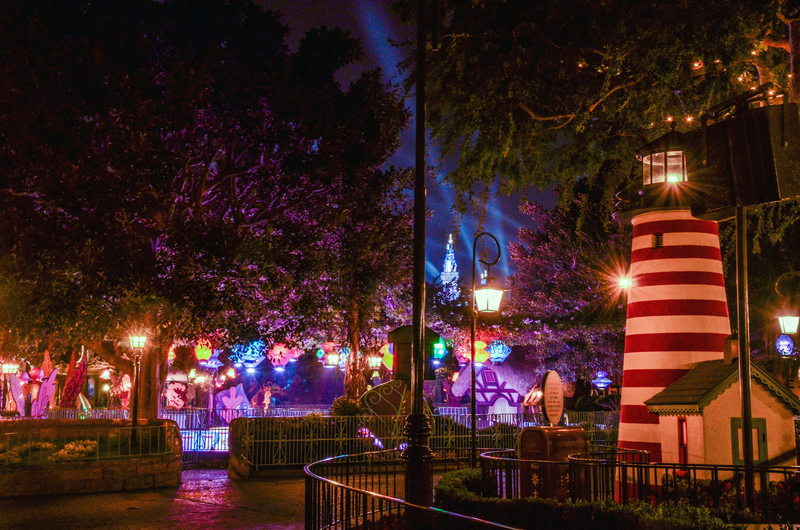 All of the attractions in the land are best experienced at night. Maybe the highest compliment I can give Cars Land at night is that I never want to leave the area. I just grab a seat and people watch, soaking in the atmosphere. 1. 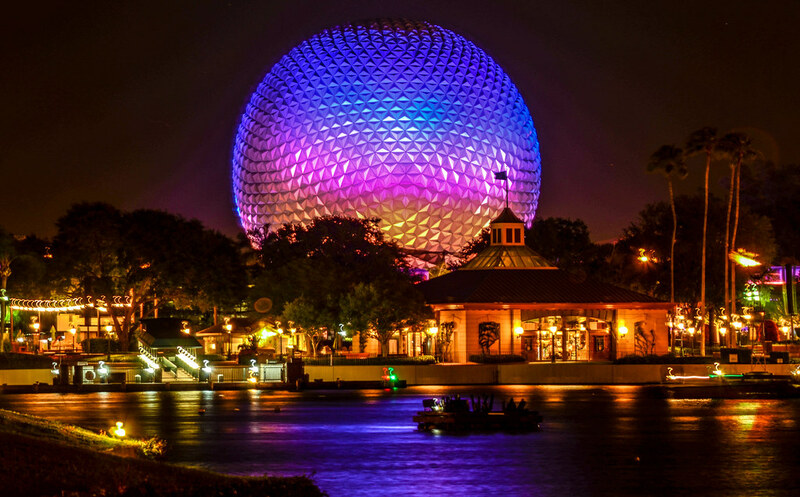 World Showcase (Epcot) – As much as I love all the other lands on this list, World Showcase is the clear choice for number one. The torches come on and that pre and post Illuminations background music comes on. World Showcase’s idea is for guests to experience other cultures and realize how small of a world we live in is. Unity is the goal and once Illuminations: Reflections of Earth starts it’s hard to not feel that. While that in and of itself is worth the number one spot, the stroll around World Showcase after Illuminations is another remarkable experience. Again, the background music makes the stroll even more incredible. 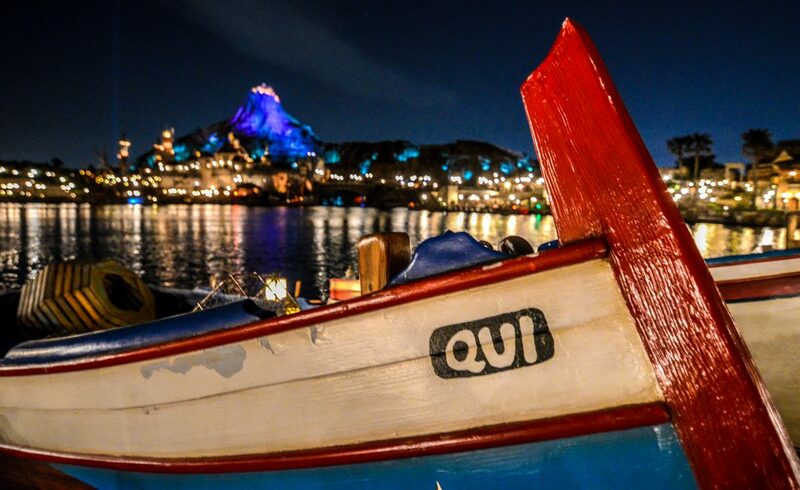 There is something so peaceful about the post-Illuminations walk. World Showcase makes for a wonderful night, running a gauntlet of beautiful emotions. Those are my top-ten lands at night. What would your list be? Let us know in the comments! If you enjoy what you’re reading here on Wandering in Disney please subscribe to the blog via email or WordPress and like our social media pages. You can find all of those things on the right side of this page. Thank you very much for reading, we appreciate it!